While some Ivy League colleges have a medical, law or business school, and other Ivies have all three, if you’ve ever wondered why Princeton does not have any, it’s because the focus is on the undergraduate education. And while Princeton does have an engineering school, the university’s commitment is to the liberal arts education. Perhaps this is why Princeton students so love their school and why Princeton University Admissions is getting that admission rate to drop year after year. Princeton University does not have a law, medical, or business school (photo credit: Alfred Hutter). With 5,100 undergraduates, Princeton students have the advantage of studying on a gorgeous campus in an upscale, affluent, cosmopolitan town that’s a world-class research institution with renowned professors who care about teaching undergraduates. Founded as an all male college in 1746, Princeton University is the fourth oldest college in the United States. An hour train ride in either direction allows students to take day trips to Philadelphia or New York City. Princeton students are candidates for either a Bachelor of Arts degree (A.B.) or a Bachelor of Science in Engineering (B.S.E.). In addition, the interdisciplinary certificate programs offer undergraduates a plethora of opportunities to pursue other areas of interest. With a cap of 15 students, the freshman seminars are a memorable part of a Princeton education. With 75 freshman seminars to choose from, topics are as interesting as “Epigenetics, or “How the Tabby Got Her Stripes” (given by none other than Princeton’s president Shirley Tilghman, a world-renowned authority on genetics), “Life on Mars — Or Maybe Not,” or “Cultural Revolutions of the Sixties.” And of course another highlight of a Princeton education is the preceptorial system. In most lecture courses, there’s a preceptorial in which students meet in small groups after a lecture to share their views. With Princeton’s motto “Princeton is the nation’s service and the service of all nations,” it’s no wonder that the university boasts about its flagship program, The Woodrow Wilson School. This concentration is open to juniors and seniors and is the only one at the university that is selective. The Woodrow Wilson School seeks to educate Princeton undergraduates who seek to pursue careers in public service and international affairs. Let it not be said that there is only one Ivy League university that has a residential college system. Princeton’s six residential colleges – Butler, Forbes, Mathey, Rockefeller, Whitman, and Wilson – offer an environment where students can find social, cultural, extracurricular, and academic happiness. 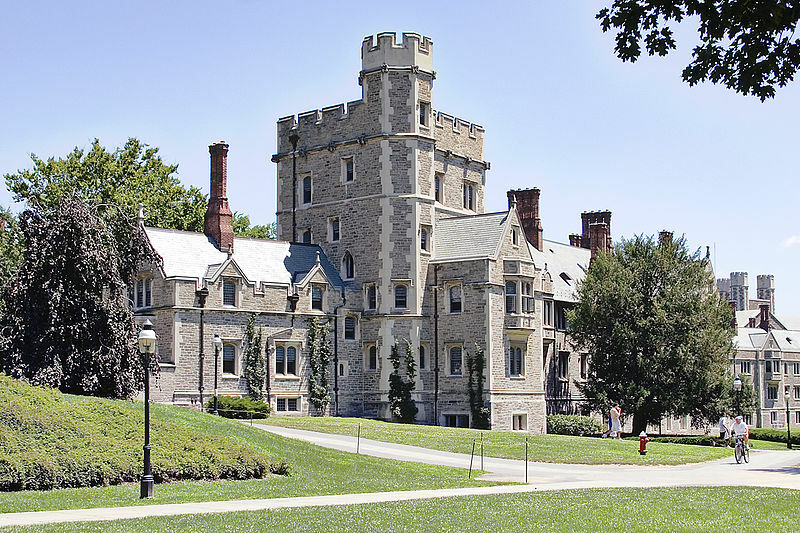 Entering freshmen are randomly assigned to a residential college, and they can call that college home for their four years at Princeton if they choose to do so. Housing is guaranteed for 4 years and 98% of all students live on campus. Each college has its own master, dean, and academic advisor. The residential colleges host their own dance lessons and dances, yoga sessions, film nights, trips, intramural competitions, and freshmen seminars. Each RC is architecturally unique (three of which are done in Gothic) consisting of a cluster of dormitories and facilities ranging from dining halls to game rooms to music studios to TV and study rooms. There is social interaction and intramural competitions between the residential colleges. Similar to the residential colleges, but different, and with a bit of a price tag (although financial aid can help defray the cost) are Princeton’s eleven eating clubs. These clubs are open to juniors and seniors and are not only great places to dine, but they also dominate the social scene. They serve as intellectual communities. About 70% of Princeton’s students join the eating clubs that are all mansions located on Prospect Avenue, or commonly known as “The Street.” Six of the clubs – Cannon, Tower, Cap and Gown, Tiger Inn, Cottage, and Ivy – are selective and choose their members through a process called “bicker” which consists of interviews, competitive games and evening activities. In the other five eating clubs – Terrace, Colonial, Charter, Cloister, and Quad – members are chosen through a process called “sign-ins” where students rank their preference on a one-to-five scale and are selected on a first-come, first-serve basis. Students who decide to bicker and are not admitted to any of the six clubs are then asked for their preference for sign-ins. While students may not get into their first choice, all students who want to join an eating club through bicker or sign-in are admitted. Fraternities and sororities are a social option for those who don’t want to belong to an eating club, but most students who belong to fraternities and sororities also belong to an eating club. Other options to eating clubs are the residential colleges and cooperatives. With a total of 27,290 applications for a targeted class of 1,310 freshmen, Princeton University Admissions admitted 1,908 students for the Class of 2019. This resulted in an overall admissions rate of 7.0 percent, the lowest in Princeton’s history.